A fiberglass siding piece may be formed. The fiberglass siding piece includes an upper seating portion of the fiberglass siding piece. The upper seating portion includes an angled siding seat. The fiberglass siding piece further includes a main portion of the fiberglass siding piece, and a lower seating portion of the fiberglass siding piece. The lower seating portion includes an angled siding seat. The angled siding seat of the upper seating portion is configured to receive the angled siding seat of the lower seating portion of an adjacent fiberglass siding piece. The upper seating portion may include slots configured to accept fasteners to fasten the fiberglass siding piece to a building. 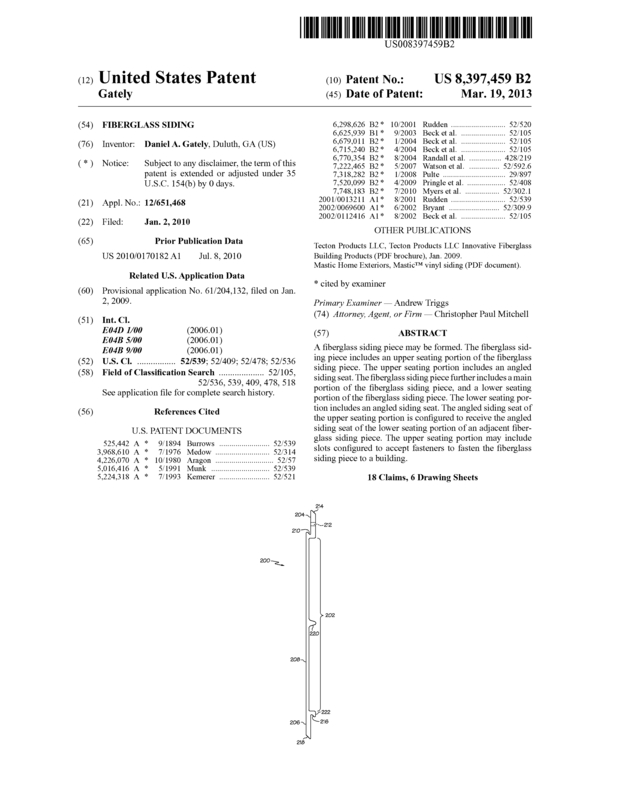 This patent has a continuation application on file with the USPTO. The worldwide siding market is estimated at over $90 billion with 65% of that total being in the residential market segment. Projected siding market growth is estimated at over 5% per year through 2017. RBG Super-Siding (TM) is a fiberglass based siding product that is made using the Pultrusion method. Its design creates an air & water tight seal when applied to any structure and is completely waterproof . It is also easier to install than any siding product currently on the market and is completely recyclable. I would be interested in an outright sale of this patent or a possible licensing agreement. Page created at 2019-04-25 4:01:14, Patent Auction Time.